Recently I returned to dine at Olympen, and irritatingly enough - I like it better and better, and even the chandeliers are growing on me. Saturday I had a good lunch at Oscars. These are two recent culinary experiences. I will also show you where to get a very cheap Indian dinner and where to drink in an old furnace / workshop. 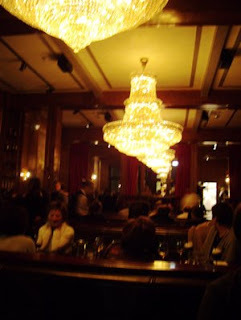 Here they are - the large crystal chandeliers at Olympen, or Lompa. I have already told you on my mixed feelings on the newly restoration of the old beer hall. Irritatingly enough, it is growing on me - even the chandeliers. Let us face it, it will never be the old beer hall, as it once was - a place for all to come. 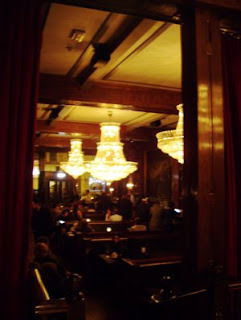 It has reappeared as an elegant European café, and as such it is a kind of a success. The best of it all are the restoration and preservation of the old paintings from 1928 by the Norwegian painter Hans Henrik Sartz Backer (1864-1948), depicting streets and buildings long gone from old Oslo. My nephew Knut Ørnes and I went to dine there. I had already enjoyed an open sandwich with Skagenrøre, good, but not great. The beer plate served to my friend Terje was equally uninteresting. So my experiences were not the greatest, but I would have another go. And I did not regret that choice. 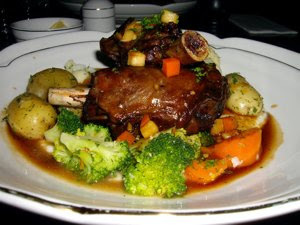 Lamb shanks are delicious, when prepared correctly, and was I excited that Olympen had lamb shanks as the days offer. The shanks were lightly salted, succulent and very tender. They were served with small potatoes, broocoli, and carrots with a very tasty gravy. The cauliflower puré was the base of it all. A sweet contrast to the aromatic sauce and the salty meat. Saturday lunch, I was joined by my good friend Laila. 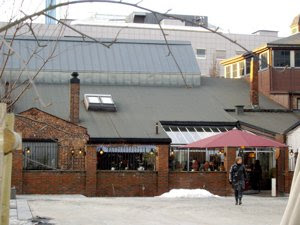 We wanted to try a new restaurant, and we ended up in Mandalls gate, an old street that now lead us into a completely newly constructed part of Oslo. 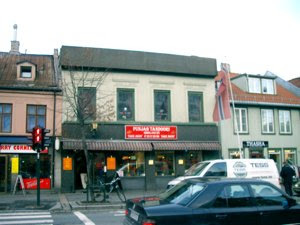 Here you find Teaterplassen, a new square where you have a few very interesting places to eat. You have the restaurants Vognmand Nielsen, Oskars Bar & Pizza, Evita coffee shop, and the charming bar Oslomekaniskeverksted. Oskar Pizza & Bar has a mix of Mexican and Italian food, reflected in the ecclectic mix of decorative elements from many different parts of the world. Pizza, sandwiches, salads, taco, etc. 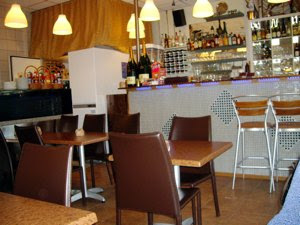 Prices of lunch and dinner is up to €20. 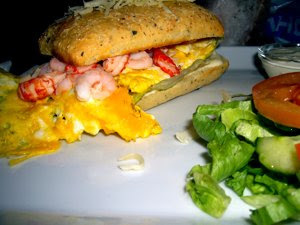 We decided to go for the ciabatta with Skagen salad, believing we would get a toasted slice of Italian bread with mayonnaise mixed with shrimps, crayfish, onion, and salted roe. And the price - 284 NOK (€35) for two sandwiches, and two pints of beer. Very good. A definite favourite. A bar in what used to be a furnace/ mechanical workshop. 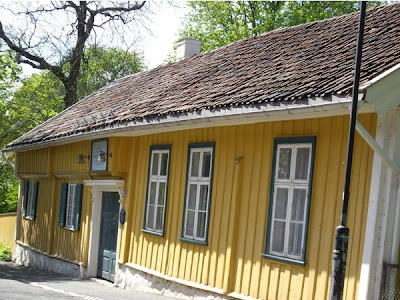 The old red brick buildings house the bar itself, as well as Det Åpne Teater, an experimental theatre where young and hopeful playwrights may get actors to perform their dramas. The bar has an industrial interior, with rustic red brick walls. The interior design is ecclectic, with a mix of new and old chairs, tables, lamps and decorations in different styles. Here you drink, as the bar has no kitchen. You may however book a pizza from a nearby restaurant if you should want something to eat. This is the place for real budget dining. Here you can get a very good Indian Meal at an unbeatable price. Located at Grønland, in the middle of the ethnically mixed East End, you are in walking distance to the city centre of Oslo. Even Andread Viestad, the Norwegian celebrity cook, after describing the first impression as "a horror version of a diner with formica-decor", he ended up by saying that it is one of the best Indian places in Oslo. I agree. You get hot food from €3-4, and it tastes great. So if you are on a budget and want interesting food to eat, this is the place.